Upon successful completion of this class, you can apply for your Kansas Concealed Carry License. 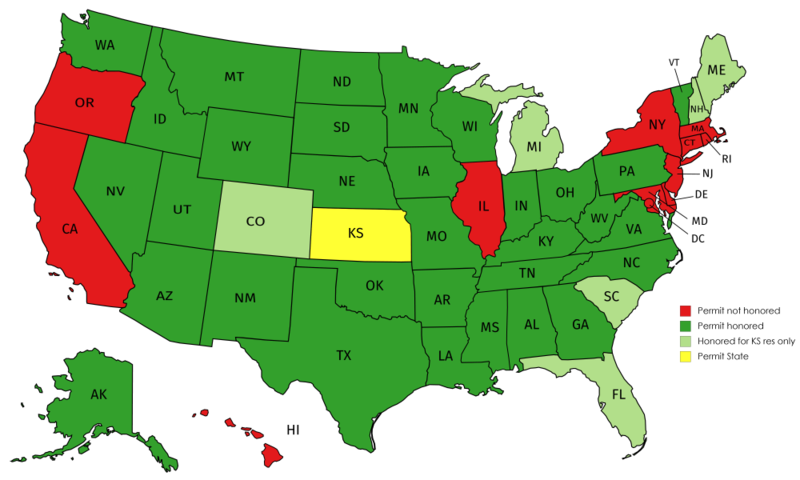 The Kansas license is valid in 38 states. You want your Concealed Carry Class instruction to be the best available. You want the material to be high-quality and engaging. As United States Concealed Carry Association Instructors, we are licensed to use their excellent training curriculum. Our PowerPoints, videos and training books are the absolute best in the industry. At Kansas Gun Class, one of our core philosophies is that you can't teach what you don't know, and you can't train others in skills you don't possess. With this in mind, we only hire the best firearms instructors, and we ensure they stay the best through ongoing training and development. By combining the knowledge of the United States Concealed Carry Association and skills our instructors hone at Front Sight Firearms Training Institute in Nevada, you can be assured that you are taking the finest training available. Designed for those wishing to secure a Kansas Concealed Carry License.